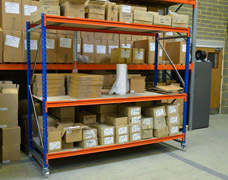 Mobile shelving trolleys provide a practical way to transport and store goods within a variety of warehouse, factory and stockroom applications. Heavy duty racking trolleys as shown in these photographs allow individual heavy items or boxed goods to be wheeled between workstations or workplace areas to speed up manufacturing, packing or stock-picking functions. to duty movable storage that can be moved anywhere within the aircraft hanger. 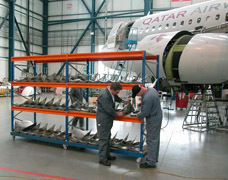 The middle photograph below shows how heavy duty longspan shelving trolleys are used during aircraft maintenance checks. 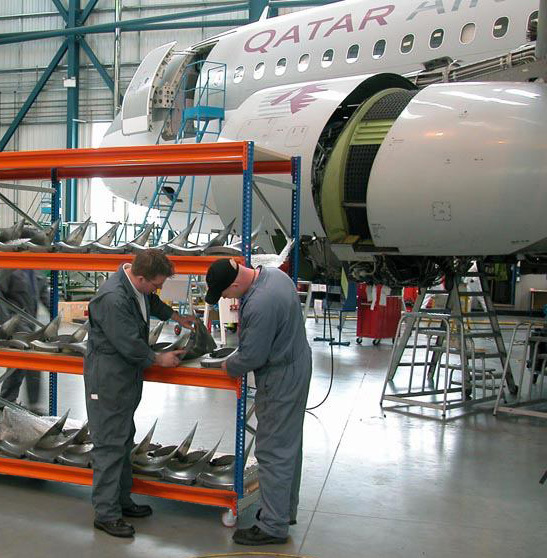 Aircraft engine components are removed and systematically placed onto the mobile shelving trolley, the parts are then stored until required for re-assembly. This solution provided a capacity of 600kg and 6 heavy duty swivel castors provided easy movement of the parts. 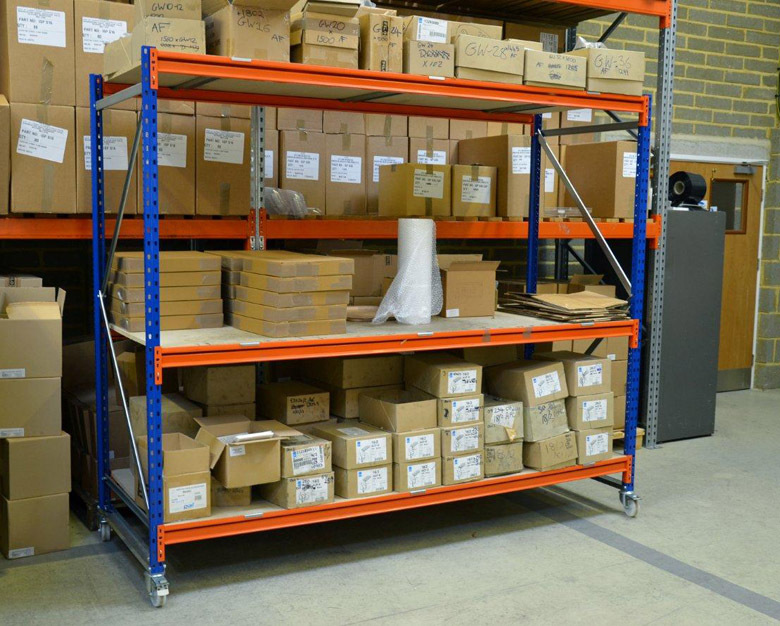 Although this unit was specifically designed for the customer, similar systems can be easily built using our heavy duty longspan racking or any of our other modular shelving systems to create a bespoke shelving trolley perfectly suited to any requirement. Heavy duty mobile shelf trolleys can also be used as mobile packing benches (see photo above-left), cleverly combining storage and workspace in one cost-effective solution. These units can be supplied with any number of shelves and feature adjustable shelf heights to accommodate anything from simple packaging materials to boxes of component parts. 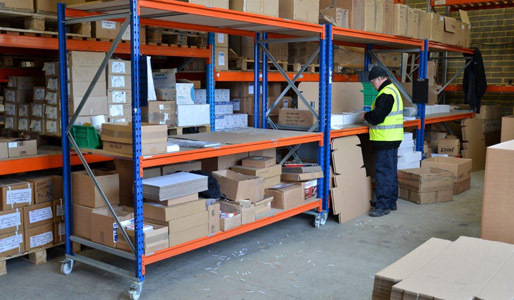 Having everything to hand in packing and order preparation areas greatly increases productivity and because the trolleys can be moved, packing stations can be quickly relocated to different areas of the building as and when necessary. 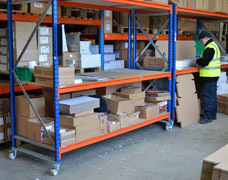 We specialise in supplying shelving trolleys that can be tailored to suit your specific needs. No matter what environment you work in or what items need to be stored or transported, we can supply a mobile trolley that will prove to be an essential piece of equipment for your business.